Harbour Pointe Hard Floor Decorative Chairmats. Personalize your home or office with the the most amazing patterns available. The new style called a harbour pointe chairmat. 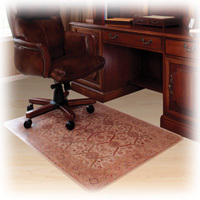 This decorative and fantastic looking chairmat is the perfect design complement to all office environments. Duramat thickness for Hard Surface Flooring Unique rich floral patterns and dark colors will transform your office space into a creative sanctuary. Each harbour pointe design is applied to the bottom of the chairmat through a patented process which helps prevent pattern wear.